I bought this car from a dealer in Yorkshire in September 2016. 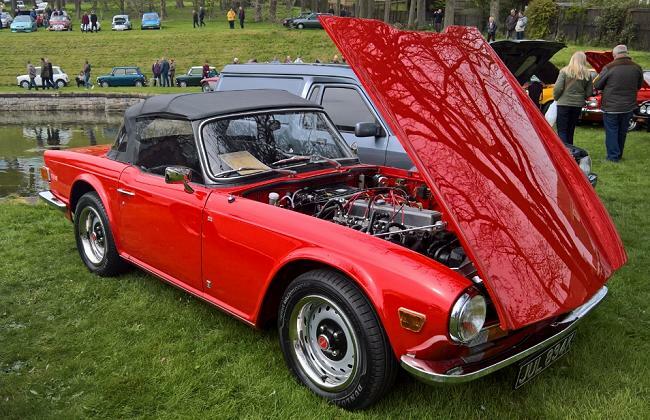 From the Heritage certificate it was built in October 1971 and sold in January 1972 by a dealer in central London and still has matching engine, chassis and key numbers and mileage of 74,000 – assumed correct with the previous MOT’s and history that came with the car. It had a ‘body off chassis’ fully documented restoration (with photographs) 20 years ago with around 55,000 on the clock. Now showing 74,000 it was ready for a little light restoration. When I inspected the vehicle I could see the potential so a ‘trade’ deal was struck! The car was road legal when I purchased it so I drove it home to Durham from Malton in North Yorkshire. However on the way home I experienced an unusual misfire every few miles and a vibration from the rear if I drove over than 60 mph. The large box of spare injection parts in the boot was a give-away that the previous owner had been trying to fix the misfire but had given up. I worked through the ignition system and found the earth on the Lumenition amplifier to be poor and the screw down the centre of the distributor shaft under the rotor arm to be loose. Once corrected the misfire did not return. I have ran my own garage business for almost 18 years and as soon as the salt hit the roads I brought the car to my workshop to start the winter overhaul. The first job was to check out the vibration from the rear, the drive shafts had worn universal joints and the slip joint in the middle had ceased. I looked at options for drive shafts and decided to push the boat out and fit a pair of modern CV jointed shafts with up-rated hubs and wheel bearings supplied by TRGB. The diff was removed and new seals fitted to stop the oil leak, it was reinstalled with new mountings, the rear suspension arms were power coated and poly bushed and up-rated studs were fitted with a kit from Classic Driving Developments. New standard springs were fitted and the chassis cleaned and wax oiled. The front suspension has also been overhauled, new standard springs and Spax adjustable shockers fitted. The wheels were refurbished and powder coated and had new tyres fitted. The brakes were all new so were just stripped, cleaned and refitted. I purchased a set of Magnecor ignition leads, which are made to measure, I discovered the 5 minute job I thought it would be to fit them became considerably longer as the engine had been timed 180o out, so number 1 plug lead was where number 6 plug lead should have been on the distributor. Therefore I had to alter the distributor timing and the fuel metering unit timing by 180o to make them fit. The injection system was serviced and overhauled, as this can be one of the most problematic areas of these cars. The interior had been replaced during the previous restoration and was still as new. The hood had been left down so long that it had split but there was a new one in the boot which I had fitted. I then turned my attention to the body, the front grill was removed, restored and powder coated. The engine bay was cleaned and detailed with many parts being powder coated. The paint work was restored with a wet flat and polish to remove the swirl marks and scratches it had gained over the last 20 years. The underbody was fully wax oiled. I haven’t dared add up how much I have spent on parts or time but I hope I have made a great reliable car to drive as I intend to use it as much as possible.